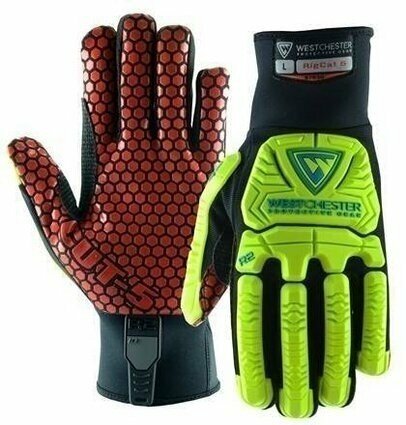 Synthetic leather double palm with reinforced red silicone palm and fingers that provide oil resistance and excellent gripping and visibility, long neoprene cuff with ID tag with place for name, TPR heavy duty knuckle and back of hand protection. The RigCat 5’s palm was specifically designed for grip enhancements in slick conditions. Silicone repels liquids ensuring the integrity of your grip even when completely submerged. The honeycomb pattern helps channel liquids away from the silicones surface allowing you to keep working for longer periods of time. This chart must be printed out to use. Please review the chart below to determine your accurate glove size for West Chester.